Winter Vacationing in the Beautiful Rocky Mountains. Your vacation starts with two nights at the exquisite Fairmont Banff Springs, a 100 year old resort castle in Banff National Park. You will be introduced to Canadian Rockies mountain skiing at two ski hills in the Banff area. 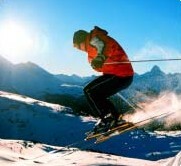 Your vacation finishes with 2 nights at the Fairmont Chateau Lake Louise and ofcourse another fun-filled day of skiing.